A few of the coins found by Nick Davies. Source: Daily Mail UK. “The Archaeology Hour” – the radio podcast soon to be a video podcast soon to be a cable channel program is developing well. Our pilot program being pulled to gather now will have features on a number of major discoveries around the world from Egypt to the UK. Irene Morfi will be talking to us about a discovery at two tombs at Sheikh Abd el-Gourna near Thebes. They were discovered in the 19th century and though to be a small tomb complex. A re-examination by Morfi and her colleagues revealed an undiscovered shaft — and this led to a massive multi-layered complex. The layout of the new complex appears to have been constructed to represent the mythical tomb of Osiris, an important figure in the creation myth of the ancient Egyptian culture. We will be asking Dr. Morfi about the most recent work on the tomb complex — and why it was never discovered when early explorers entered the smaller tomb as far back as 1887. We will also be talking to archaeologist James Drummond-Murray of Oxford Archaeology about a dig near a cemetery in Luton, Bedfordshire. The local council decided to lay a new road to improve access to the cemetery—and the work unearthed a Roman burial. Archaeologists then discovered that not only had the area had been used as a burial site from Roman times to the present — but that even Bronze age and neolithic age artifacts were present on the site. We’ll chat to Drummond-Murray about what this may mean, possibly a continuously used sacred site from very ancient times to the present. Vincent Drost is an ancient coin expert at the British Museum in London. 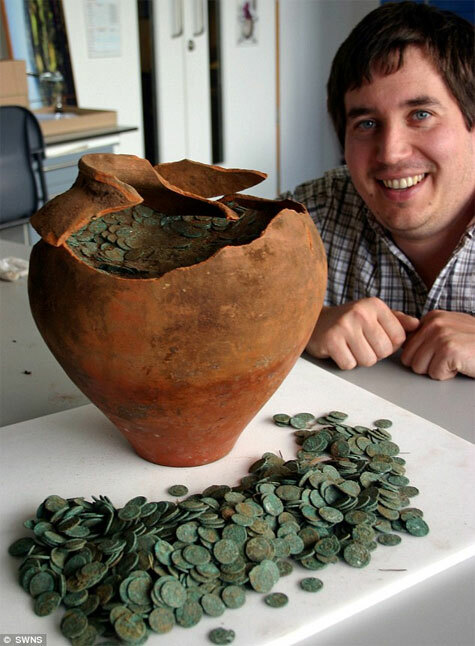 He will be talking to us about more than 10,000 Roman coins found in a clay jar by metal detectorist Nick Davies (who was on his very first outing with his metal detector). We’ll talk about theories as to why the hoard was buried (almost three hundred years before Saxons and Vikings were reading Britain) and what they tell us about Roman coin production at the time. Nick Davies and the pot. Daily Mail. We are also working on one of my favorite topics – English witchcraft. Researcher Brian Hoggard has made a study of methods and spells used by people to ward off the evil castings of witches (always something to watch out for). He will chat with us about recent research—and perhaps provide us with some useful advice into the bargain. 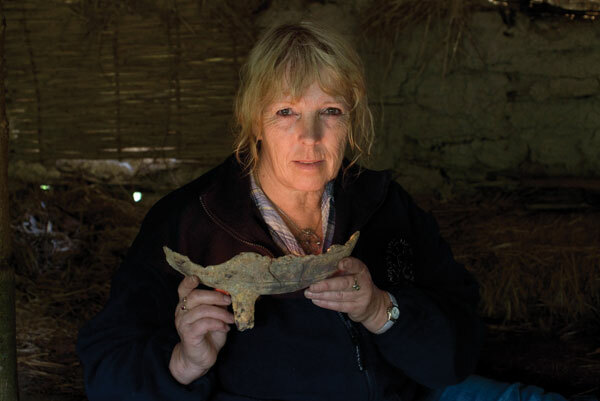 Archaeologist Jackie Woods found a witchcraft related site in own backyard in Cornwall – that dated from the ancient past to modern times! Source: Archaeology Magazine.